Goosegrass (Eleusine indica) is a monocot weed in the Poaceae family. In Bolivia this weed first evolved resistance to Group A/1 herbicides in 2005 and infests Rice, Soybean, and Wheat. Group A/1 herbicides are known as ACCase inhibitors (Inhibition of acetyl CoA carboxylase (ACCase)). Research has shown that these particular biotypes are resistant to clethodim, cyhalofop-butyl, fluazifop-P-butyl, and haloxyfop-methyl and they may be cross-resistant to other Group A/1 herbicides. The 'Group' letters/numbers that you see throughout this web site refer to the classification of herbicides by their site of action. To see a full list of herbicides and HRAC herbicide classifications click here. Greenhouse trials comparing a known susceptible Goosegrass biotype with this Goosegrass biotype have been used to confirm resistance. For further information on the tests conducted please contact the local weed scientists that provided this information. The mechanism of resistance for this biotype is either unknown or has not been entered in the database. If you know anything about the mechanism of resistance for this biotype then please update the database. There is no record of differences in fitness or competitiveness of these resistant biotypes when compared to that of normal susceptible biotypes. If you have any information pertaining to the fitness of Group A/1 resistant Goosegrass from Bolivia please update the database. The Herbicide Resistance Action Committee, The Weed Science Society of America, and weed scientists in Bolivia have been instrumental in providing you this information. Particular thanks is given to Pablo Franco for providing detailed information. Yu, Q., A. Jalaludin, H. Han, M. Chen, R.D. Sammons, and S. Powles. 2015. Evolution of a Double Amino Acid Substitution in the 5-Enolpyruvylshikimate-3-Phosphate Synthase in Eleusine indica Conferring High-Level Glyphosate Resistance. Plant Physiology 167 : 1440 - 1447. Glyphosate is the most important and widely used herbicide in world agriculture. Intensive glyphosate selection has resulted in the widespread evolution of glyphosate-resistant weed populations, threatening the sustainability of this valuable once-in-a-century agrochemical. Field-evolved glyphosate resistance due to known resistance mechanisms is generally low to modest. Here, working with a highly glyphosate-resistant Eleusine indica population, we identified a double amino acid substitution (T102I + P106S [TIPS]) in the 5-enolpyruvylshikimate-3-phosphate synthase (EPSPS) gene in glyphosate-resistant individuals. This TIPSmutation recreates the biotechnology-engineered commercial first generation glyphosate-tolerant EPSPS in corn (Zea mays) and now in other crops. In E. indica, the naturally evolved TIPS mutants are highly (more than 180-fold) resistant to glyphosate compared with the wild type and more resistant (more than 32-fold) than the previously known P106S mutants. The E. indica TIPS EPSPS showed very high-level (2,647-fold) in vitro resistance to glyphosate relative to the wild type and is more resistant (600-fold) than the P106S variant. The evolution of the TIPSmutation in crop fields under glyphosate selection is likely a sequential event, with the P106S mutation being selected first and fixed, followed by the T102I mutation to create the highly resistant TIPS EPSPS. The sequential evolution of the TIPS mutation endowing high-level glyphosate resistance is an important mechanism by which plants adapt to intense herbicide selection and a dramatic example of evolution in action..
Chen, J., H. Huang, C. Zhang, S. Wei, Z. Huang, J. Chen, and X. Wang. 2015. Mutations and amplification of EPSPS gene confer resistance to glyphosate in goosegrass (Eleusine indica). Planta 242 : 859 - 868. Glyphosate has been used widely in the south of China. The high selection pressure from glyphosate use has led to the evolution of resistance to glyphosate in weeds. We investigated the molecular mechanisms of three recently discovered glyphosate-resistant Eleusine indicapopulations (R1, R2 and R3). The results showed that R1 and R2 had double Thr102Ile and Pro106Ser mutation and a single mutation of Pro106Leu in the 5-enolpyruvylshikimate-3-phosphate synthase (EPSPS) gene, respectively. Escherichia coli containing the mutated EPSPS genes was tolerant to glyphosate. EPSPS activity in R1 and R2 plants was higher than in the sensitive plants. There was no amino acid substitution in EPSPS gene in R3. However, expression of EPSPS in R3 plants was higher than in glyphosate-susceptible (S) population (13.8-fold) after glyphosate treatment. EPSPS enzyme activity in both R3 and S plants was inhibited by glyphosate, while shikimate accumulation in R3 was significantly lower than for the S population. Further analysis revealed that the genome of R3 contained 28.3-fold more copies of the EPSPS gene than that of susceptible population. EPSPS expression was positively correlated with copy number of EPSPS. In conclusion, mutation of the EPSPS gene and increased EPSPS expression are part of the molecular mechanisms of resistance to glyphosate in Eleusine indica..
Cha ThyeSan ; Anne-Marie, K. ; Chuah TseSeng. 2014. Identification and characterization of RAPD-SCAR markers linked to glyphosate-susceptible and -resistant biotypes of Eleusine indica (L.) Gaertn. Molecular Biology Reports 41 : 823 - 831. 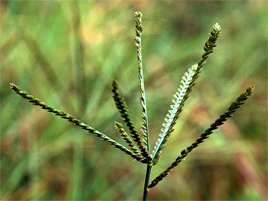 Eleusine indica is one of the most common weed species found in agricultural land worldwide. Although herbicide-glyphosate provides good control of the weed, its frequent uses has led to abundant reported cases of resistance. Hence, the development of genetic markers for quick detection of glyphosate-resistance in E. indica population is imperative for the control and management of the weed. In this study, a total of 14 specific random amplified polymorphic DNA (RAPD) markers were identified and two of the markers, namely S4R727 and S26R6976 were further sequence characterized. Sequence alignment revealed that marker S4R727 showing a 12-bp nucleotides deletion in resistant biotypes, while marker S26R6976 contained a 167-bp nucleotides insertion in the resistant biotypes. Based on these sequence differences, three pairs of new sequence characterized amplified region (SCAR) primers were developed. The specificity of these primer pairs were further validated with genomic DNA extracted from ten individual plants of one glyphosate-susceptible and five glyphosate-resistant (R2, R4, R6, R8 and R11) populations. The resulting RAPD-SCAR markers provided the basis for assessing genetic diversity between glyphosate-susceptible and -resistant E. indica biotypes, as well for the identification of genetic locus link to glyphosate-resistance event in the species..
McCullough, P. E. ; Yu, J. L. ; Gómez de Barreda, D.. 2013. Efficacy of preemergence herbicides for controlling a dinitroaniline-resistant goosegrass (Eleusine indica) in Georgia. Weed Technology 27 : 639 - 644. Goosegrass is a problematic weed in turfgrass, and overuse of dinitroaniline (dna) herbicides has resulted in evolution of resistant populations. The objectives of this research were to (1) evaluate responses of a susceptible (S) goosegrass compared to a suspected resistant (R) biotype from Griffin, GA to prodiamine, and (2) evaluate efficacy of various PRE herbicides for control. Prodiamine rates required for 50% control and 50% shoot reductions after 6 wk for R-goosegrass measured >13.44 and 3.2 kg ai ha-1, respectively, whereas rates for the S-population measured 0.45 and <0.42 kg ha-1, respectively. In field experiments, sequential applications of dithiopyr and prodiamine provided <20% control of R-goosegrass over 2 yr. Single applications of dimethenamid-P at 1.68 kg ai ha-1 provided <50% goosegrass control in 2011 but provided excellent control (≥90%) at 7 mo after initial treatments (MAIT) in 2012. Single and sequential applications of indaziflam provided excellent control of goosegrass in both years, and oxadiazon controlled goosegrass >85% at 7 MAIT in 2011 and ≥90% in 2012. Single and sequential PRE sulfentrazone applications controlled goosegrass <60% in 2011 but averaged 94% control in 2012. Overall, indaziflam and oxadiazon provided good (80 to 89%) to excellent control of dna-resistant goosegrass in both years, but dimethenamid and sulfentrazone were inconsistent..
Lopes Ovejero, R. F. ; Soares, D. J. ; Oliveira, W. S. ; Fonseca, L. B. ; Berger, G. U. ; Soteres, J. K. ; Christoffoleti, P. J.. 2013. Residual herbicides in weed management for glyphosate-resistant soybean in Brazil. Planta Daninha 31 : 947 - 959. In agricultural production systems where the glyphosate-resistant soybean crop (Glycine max) is grown and the practice of crop rotation with alternative herbicides is not adopted, the exclusive and continuous use of glyphosate has led to the occurrence of resistant weed populations that may limit or compromise the benefits of this technology. Thus, the efficacy of weed management programs, including the use of residual herbicides (sulfentrazone, flumioxazin, imazethapyr, diclosulan, chlorimuron and s-metolachlor) applied in preemergence and followed by in-crop postemergence applications of glyphosate (PRE-POST) were compared to glyphosate postemergence only programs - POST. The study was conducted across nine locations during the 2009/2010 and 2010/2011 growing seasons. PRE-POST programs were efficient in the control of Amaranthus viridis, Brachiaria plantaginea, Bidens pilosa, Commelina benghalensis, Eleusine indica, Euphorbia heterophylla and Raphanus raphanistrum, with the level of control being similar when comparing the program with two applications of glyphosate POST. Some PRE-POST programs were not efficient in controlling Cenchrus echinatus, Ipomoea hederifolia and Ipomoea triloba. Sulfentrazone and diclosulam PRE-POST programs improved the control of Ipomoea triloba compared to sequential applications of glyphosate alone. No significant differences in soybean yield were observed between any of the herbicide treatments or study locations. The use of residual herbicides in preemergence followed by glyphosate in-crop postemergence provides consistent weed control and reducing early season weed competition. Furthermore, these programs utilize at least two herbicide modes of action for herbicide use diversity, which will be needed to stay ahead of resistance build-up, regardless of when weeds may appear.. PERMISSION MUST BE OBTAINED FIRST if you intend to base a significant portion of a scientific paper on data derived from this site. Copyright © 1993- 2019 WeedScience.org All rights reserved. Fair use of this material is encouraged. Proper citation is requested.